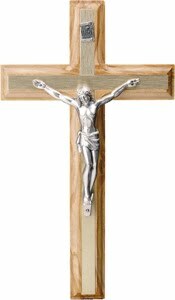 We have a new selection of crosses and crucifixes at Simple Blessings, beautiful olive wood wall crosses and resin standing crucifixes. Click here to view them! The olive wood cross has already been the most popular, with the Saint Francis Tau cross been a second favourite. Please pop by and have a quick look at our new stock, I’m sure you’ll find something special for yourself, school, church or home. ← Happy New Year for 2010!